Ratatap Drums: fastest response, best playability, 15 drum kits, editable drums. Updated for 2017. Tens of thousands of positive reviews agree: Ratatap looks and plays the best. The harder you hit the drums, the louder they sound. Swirl your finger around for slower or faster rolls. The drum sound varies slightly from hit to hit, just like real drums. With the fastest response time of any drum app, it feels incredibly good to play. Choose from one of the fifteen included kits. Unlock a hidden bonus kit. Upgrade to the full version to create your own customized drum kit, choosing from the hundreds of included sounds. 10 built-in kits — Rock, Disco, Hip-Hop, Electronic, and more! The harder you hit the drums, the louder they sound! A first for an iPhone app! The fastest response time — more than 60% faster than the competition! Hundreds of drum sounds, professionally recorded at 44.1khz high fidelity! Natural drum rolling — the faster you drag your finger, the faster the roll! Realistic modeling of drum strikes so cymbals blend and snares don’t sound like machine guns! Pitch bending depending on where you hit the drums! The interface is naturally pulled up from the center tab. Multitrack recording and online sharing! You can even share your performances online on the web! Tweet, tweet! Jam out with your iPod library tracks. 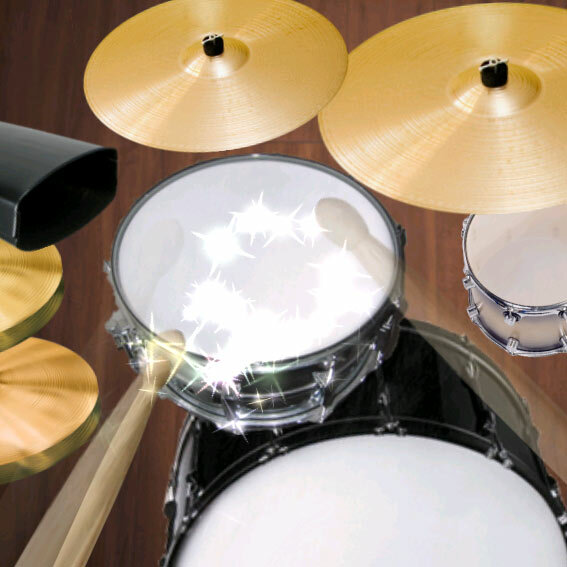 Try our “Dueling Drumsets” so two people can rock out with their own set on one device!